Kenilworth continued their unbeaten start to the league campaign with a third bonus-point victory of the season, writes Sophie Freestone. It was the hosts that got the scoreboard rolling with the first try of the afternoon. The ball went through the backs before a well-worked centre move allowed Silhillians to break through the Kenilworth defence to score. The successful conversion gave the hosts a 7-0 lead. Kenilworth responded through Ed Hannam who scored the first of his two tries. The ball made its way to Hannam on the left wing and the centre showed good footballing skills to control with his feet. The kick through was perfectly weighted and the centre pounced on the ball to touch down. The conversion from Josh Emery went wide of the uprights. The visitors then doubled their lead as the half-hour mark approached when Gareth Renowden fed the oncoming Alex Selby to break through the defensive line and score under the posts. Emery added the extras to give Kenilworth a 12-7 lead, a scoreline that remained until mid-way through the second half. 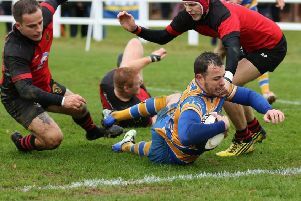 It was Kenilworth who extended their lead when Renowden went from provider to try-scorer, scooping up the loose ball after a five-metre lineout. The scrum-half then spotted a gap in the Silhillians defence and twisted his way over the line for his side’s third. Emery’s conversion went just shy of the uprights to leave the score at 17-7 with the final quarter to play. Silhillians responded just five minutes later, however, with a breakaway try on the left. A well-timed flat pass released a player on the wing who raced in from his own 22 to close the gap. The conversion went through the posts to leave Silhillians just three points adrift with just over ten minutes remaining. The closing minutes of the match proved to be a tense affair with Silhillians pushing hard to secure victory. However, Kenilworth’s counter-attack proved too strong and Hannam intercepted the ball on the Silhillians 22 and raced in to touch down under the posts deep into injury time. Emery slotted the conversion to bring proceedings to a close as Kenilworth secured another impressive bonus-point victory to stay top of the table. David Ellis’ side will be looking to maintain their winning streak when they entertain Barkers’ Butts on Saturday.